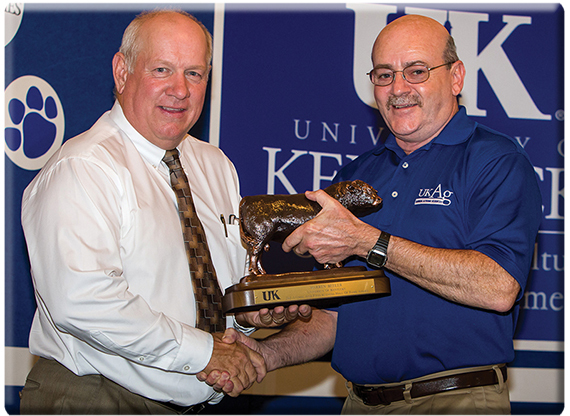 FRANKFORT, Ky. — Longtime Kentucky agriculture leader Warren Beeler earned another accolade in a ceremony during the University of Kentucky College of Agriculture, Food and Environment’s Roundup of college alumni Friday in Lexington. Beeler, the Kentucky Department of Agriculture’s director of agriculture policy, was inducted into UK’s Department of Animal and Food Sciences Hall of Fame. Induction into the Hall of Fame is the highest honor given by the Department of Animal and Food Sciences. Beeler has served the KDA for 15 years in livestock marketing and show and fair promotion. Along with advising Commissioner Comer on agricultural issues, Beeler speaks on behalf of the KDA at agriculture conferences and workshops. Beeler is a former president of the Kentucky Pork Producers Association and a Hall of Fame member, Western Kentucky University agriculture alumnus of the year, a member of the Middle Tennessee State University Animal Science Hall of Fame, recipient of the Kentucky Cattlemen’s Association Service Award, and winner of the Kentucky FFA Distinguished Service Award. Regarded as the most experienced livestock judge in the country, Beeler has judged livestock shows for 35 years in 42 states. He manages his family farm in Caneyville with his wife, Dee Dee, and their five children.